Recently, the former Kapamilya Star Claudine Barretto has been rumored dead on Facebook with spam link. Posted by a certain page, the news has spread dramatically all over the internet and has spread on social networking sites. This news startled every reader and in search of the truth behind this rumor and whoever concocted this web lies. The post on Facebook was read like this “R.I.P CLAUDINE BARRETTO (1979-2014)”. The cause of death was drug overdose. It was an age restricted video allowing viewers from age18 and above. It stirred the interest of almost all who came across the said post. Their curiosity brought them to the point of vulnerability for something unreal. 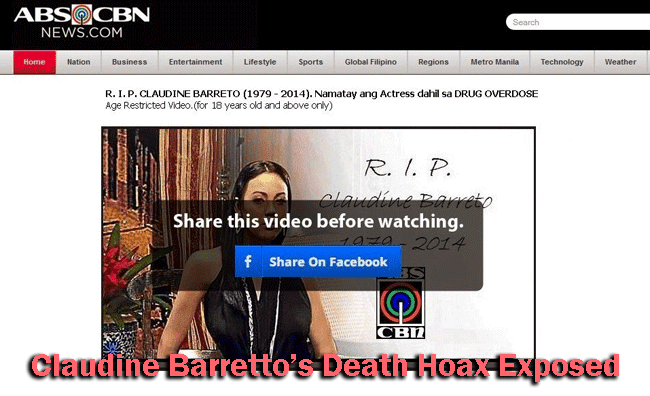 The site that started the claim of Claudine’s death looked like www.abs-cbnnews.com but came out fake even though it was using the abs-cbn’s themes. It used some links from the posts connecting to rogue Facebook apps in which the spectators has to request permission to access users’ profile information. By allowing them to access their profile, the post would automatically come out in their timelines. This helped the scam reproduce unexpectedly over the net. This might sound depressing to the Barretto family, but the good thing is, Thank God it was just a hoax. The one responsible for this may actually have a purpose of entertaining the public but it just doesn't sound entertaining at all or may want to earn by producing such ill-way of scamming.